Road trips can be a blast, with adventure ahead and new destinations to take in along the way, but if you have ever tried a road trip with kids, you may know these do not always go to plan. Everything from the whining for food and the constant ‘Are we there yet?’ and ‘How much longer?’, or the bickering in the backseat from being in close confines for too long. Road trips with kids can be a disaster, unless you plan ahead. 6.1 What are your favourite methods of surviving a road trip with kids? Kids have smaller stomachs than us so chances are they get hungry a lot more often. They also like to snack out of boredom sometimes too, so having an abundance of good food for a road trip with kids is essential. Make sure to pack snacks that do not need refrigeration, unless you have a quality esky to keep them cool. Also avoid the high sugar snacks or you could end up with hyperactive kids who won’t cope well with being confined to a car or other vehicle for prolonged periods. It can be a lot of fun for the family, adults included, to play some travel games along the way. This is good for bonding time, along with keeping the kids amused during the long drive. Games such as I Spy, where you take in turns picking an item and giving only the first letter for the rest of the family to guess, or a scavenger hunt are a great option. The scavenger hunt items you can either make up on the go, or create a list before you leave and tick it off together. When travelling with kids, it always helps to have a few of these you can play on demand. Giving the kids a chance to stop and stretch their legs makes a huge difference when taking a road trip with kids. They are not so great at sitting still for long periods so be sure to take breaks for meals and toilet stops, as well as some just because stops if everyone is getting restless. If travelling by car, this is good for the drivers too. As they say – Revive and Survive. Depending on the age of your kids, they may enjoy some travel-friendly activities, such as colouring books, busy bags or having some favourite toys to play with. Sure it may get a little messy, but happy kids = happy parents. Creating your own travel activity packs is a great option and this is something we also do when we fly as well as for long car trips. If they bore of the non-electronic forms of entertainment, it may be time to pull out the technology. An iPod or iPad, gaming device or other technological gadget can provide a lot of amusement and a bit of down time along the way. It may not be ideal for family travel bonding, but chances are it will keep them quiet for a while and that is refreshing. 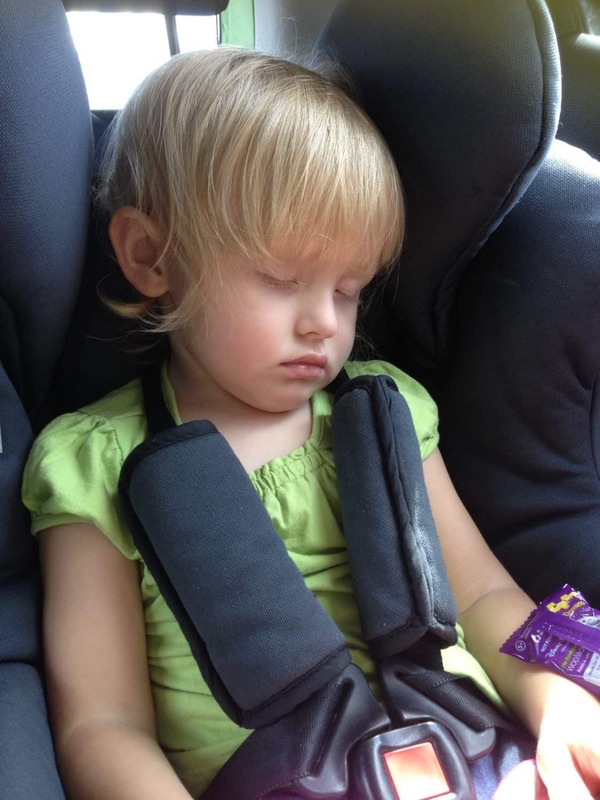 Ensuring your kids are comfortable is a big factor in encouraging rest time. If you have room, pack a pillow and even a blanket for them so they can take some time to shut their eyes and have a nap if they desire. Travelling for long periods is exhausting, plus it may make them less irritable than trying to over-stimulate them with entertainment the whole way. If all that fails, you can always turn up the music loud and drown out the noise of bickering and moaning in the background… I’m kidding! What are your favourite methods of surviving a road trip with kids? My little guy has only recently started tolerating trips of more than 20 minutes. He’s nearly two. He would get hysterical by about 30 minutes and heaven forbid if we had to be in the car for more than 45 minutes. Now that he’s able to tolerate the car better, we’ve started venturing further away. We can’t wait for spring so we can take him camping for the first time. My favourite game as a kid travelling in the car (and my parents took us far and wide with a caravan a lot) was to play ‘Spotto’. We’d make up a list of things like a post box, a clock, a white car with a number plate starting with the letter A, a VW, a dead kangaroo etc. and if we saw one of the items on the list, we’d yell “Spotto!” to claim it. My parents would make up funny rules about lollies so we could only have one if the car came to a complete stop at traffic lights and dad would roll up to them so slowly and cautiously and we’d be dying to know if the car would stop or not. Fantale or not this time? That is awesome. Love your road trip ideas from your childhood. Sounds like your parents had it mastered. Our two mostly sleep on long drives which is a relief but our baby will cry at traffic lights because the car is stopped lol her sister did the same. Camping with your little one sounds great. It was never something we did when I was growing up but I want to with our kids. Such an adventure. iPads are excellent but you must use them wisely. Unlike his twin sister, our little guy will not go to sleep if there is a movie on. And messing with nap time is a fast route to misery for all of us. I learnt this the hard way ? These days we stop for a snack/meal and run around just before naps are due. As we set off again we put some quiet music on and hope we get an hour or so sleep from both of them. Agree, ours suffer some sort of withdrawal when they get off the iPads and it can get quite ugly!! Haha at that age, It definitely gets harder to remove technology. Nice blog, good tips, we did most of these. Ours are older 10&13 now so easier on long trips but a lot more vocal! Last decent road trip UK-South France 17+hrs (tag team driving with lots of mini stops) We found that audio books were a good way to pass the time, great because we were all listening it was a bit more of a family activity something we could talk about… We listened to the entire hitchikers guide to the galaxy on that holiday! I absolutely love this idea! Had not thought of it but what a wonderful way to pass the time. Thank you for sharing! Very good tips Holly!Fortunately, our little one always loved to travel.But we did have to think through and pack lots of stuff to have a nice road trip with her. We practiced almost everything that you wrote above…plus we started with shorter trips, to get her accomplished and then slowly increased the duration trip by trip. We keep her fav rhymes and some toddler game apps ready with us to engage her when she gets over cranky.